So, I’m very new to blender, but I feel like I have a decent grasp on some of the base concepts involved in the process. I’ve been following a tutorial series by Darrin Lile for character modeling, UV mapping, texture painting, etc. I am not much of an artist, but I want to try my hand at game development, start to finish. It’s my prospective major after all. So, my problem is: While texture painting, the only brush/tool that seems to work is the fill tool. I can still get a lot done of what I need, but none of my finer detailed things. When asking support questions, provide more to work with than “it doesn’t work”. This means adding two things in the opening post: full interface screenshots and an example .blend of the problem. The images help you explain and also provide additional information without you saying anything, and the .blend you prepared and uploaded is used for the actual troubleshooting and producing images for the replies. Duly noted. Let me refine my question. When attempting to texture paint, the fill brush is the only one displaying on the model. Other brushes aren’t displaying on the model itself, but is showing on the UV Map/image. When using the default “TexDraw” brush, I drew a line across his chest/stomach area, and the problem occurs as described. Now, when I use the default fill brush, both changes are visible. I can see on the model and on the UV Map. Originally, I got impatient and ran forward with the design process. I used the fill tool as best I could, and I was finishing up rigging the character when I decided to make some changes that required me to re-UV map and re-texture, so I am now back at this point. I’m not sure what else I can say to help you help me. 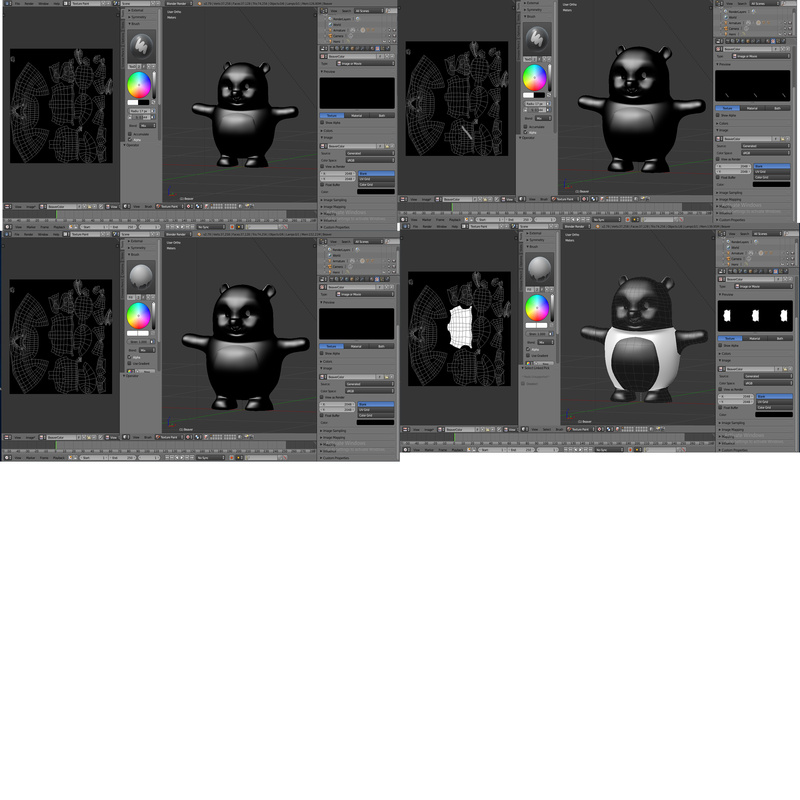 Unfortunately, BlenderArtists will not let me upload more than a single image. So I combined them into one picture, hopefully you can see what I’m talking about. Apologies for the bad photo editing. So, as a bit of an update, I’ve noticed that blender is actually painting to the wrong side of my mesh. my seams are setup to where most of my mesh has a front and a back. So painting on the model is actually painting to the opposite side. Painting the stomach applies to the back of his body, etc. It would be nice if Blender could warn about this to improve user experience. Anyway I’m not sure if it’s convenient that you have those unconnected parts for Texture paint your mesh. I would have separated it into different objects. It could display an error message in the console saying, painting on negative normal. Holy heck it worked! Thank you so much.